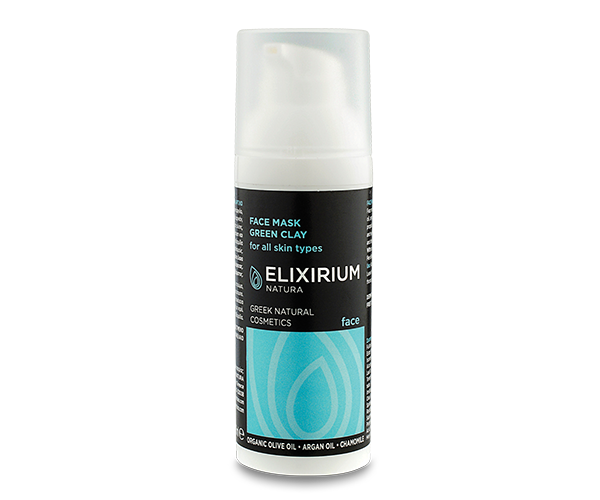 ELIXIRIUM NATURA - GREEN CLAY FACE MASK. HomeElixirium NaturaFACEELIXIRIUM NATURA - GREEN CLAY FACE MASK. With organic olive oil & argan oil, aloe vera, chamomile. Face mask with green clay. 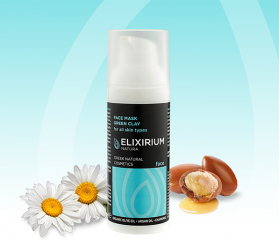 With organic olive oil, argan oil, vera, provitamin B5, aloe propolis and chamomile extracts for hydration and rejuvenation leaving skin smooth and shiny without irritation. Use: Apply a thick layer evenly on clean face. Leave for 10 minutes and then rinse thoroughly. Use 1-2 times a week. Ingredients: Aqua, Solum Fullonum (Fuller's Earth), C10-20 Acid PEG-8 Ester, Magnesium Aluminum Silicate, Cetearyl Isononanoate, Butylene Glycol, Polyisoprene, Alcohol, Aloe Barbadensis (Aloe Vera) Leaf Juice, Titanium Dioxide, Polypropylene Terephthalate, Sodium Hydroxymethylglycinate, Allantoin, Panthenol, Disodium EDTA, Imidazolidinyl Urea, Xanthan Gum, Bisabolol, Olea Europaea (Olive) Fruit Oil, Argania Spinosa (Argan) Kernel Oil,Chamomilla Recutita Matricaria (Chamomile) Flower Extract, Glycerin, Saponaria Officinalis (Soapwort) Leaf Extract, Propolis Extract, Parfum (Fragrnace), Citric Acid, Sodium Benzoate, Potassium Sorbate, Hexyl cinnamal, Limonene, CI 75810.